The successful--so far--introduction of Windows 7 and Apple's snarky advertising response to it has people wondering: Will Microsoft fire back at Apple or just take the abuse? It is time to fire back, and hard this time. No more weak-kneed "I'm a PC" stuff. Windows 7 should try to do to Mac OS X what Verizon has already done to the iPhone with its hard-hitting "iDon't" TV commercial. (See it here). It is time for Microsoft to be more aggressive in reminding folks that if you really need to run a wide range of desktop apps, only Windows does it. Or about the number of people who buy an expensive Mac, only to purchase a standalone copy of Windows to run on it for compatibility. Talk about pricey! Maybe Microsoft should remind people that the Gates Foundation is using its founders' fortune to save lives around the world. Perhaps, Microsoft could talk about Apple's almost total lack of interest in enterprise computing. Or about all those years it claimed "Exchange support" when it really didn't work very well. And, of course, most Macs I know of have a copy of Microsoft Office installed on them. The Windows version is at least as good. There is also the issue of corporate culture. Apple is the monopolist that maybe Microsoft wanted to be but could never quite manage to become. Steve and Co. have total control over virtually everything Mac OS, iPhone, and iPod. As for Microsoft, I think people who make fun of Microsoft's Japanese Burger King promotion, "Family Guy" tie-in, and insipid launch parties, are being a bit tough on the company. Check that. Promoting a seven-patty hamburger ought to be against public nuisance laws. 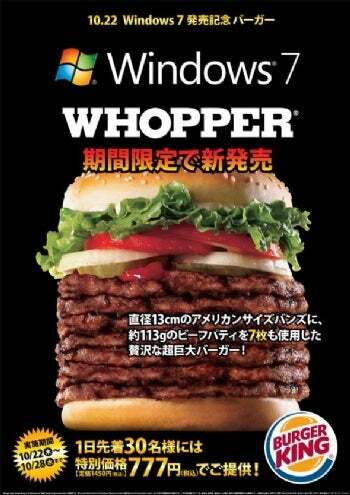 Maybe, with the "Windows 7 Whopper," Microsoft is simply trying to finish what Vista started: Kill us all. As for the other promotions, technology pros need to understand that they are not aimed at us. What used to be a cozy "world of tech" has expanded to become the same wild world everyone else lives in. Apple, on the other hand, is the master of cool, pretty much the opposite of Microsoft. Its advertising levels all sorts of potshots at Microsoft, who just seems to stumble around in response. One of the advantages Apple has is the lack of the need to be all things to all potential customers. Apple is Apple and if you don't like that, Steve Jobs will be happy to scream at you about it. Microsoft, on the other hand, strives to be everyone's computer company. Its operating systems have to work as well in big enterprises as they do for a six-year-old. That is why Microsoft's task is exponentially more difficult than Apple's. My advice to Microsoft: Take the gloves off and stop trying to be so cute (and cholesterol-laden). Now that you have an OS to be proud of, take some swings at Apple and connect some punches. Microsoft needs to take the battle to Apple, just as Verizon has done already.